Be the first to share your favorite memory, photo or story of Madonna. This memorial page is dedicated for family, friends and future generations to celebrate the life of their loved one. Madonna Dooley Allee, 90, from Rockville, passed away on August 21, 2018 at Bickford Memory Care in Crawfordsville, where she has resided for a year and a half. Her only child was by her side when she peacefully slipped away. The staff at Bickford was wonderful and her family so appreciated their care. She had lived much of her life in Marshall. She was born on August 2, 1928 to Byron and Bernice Blacketer Riley. She was married to John Leonard, Bill Dooley and Allen “Bo” Allee, who all preceded her in death. Her parents and Brother Max and his wife, also preceded her in death. Her survivors include daughter, Rhonda Mitchell (Mike) of Waveland; 2 grandsons, Clint (Kim) and children, Addison and Mackenna of Carmel, and Matt (Michele) and children Anthony Gregg, Andrew Gregg, Brodie, Luke Gregg, Emma and Kennedy of Waveland. Step children, Kirk (Susan) Allee of Kansas, their children, Jacob, Kathleen, Nicholas, Elizabeth and Micah; Nanci (Larry) Carpenter of Crawfordsville, their children, Kelly Shepard of Indianapolis, Stacy (John) Weise of Marshall; Neil (Tina) Allee of Bloomingdale, their children, Natalie (Gavin) Ryan of Raleigh, NC, Terin Allee of LaPorte, IN, and Dalen Alee in Charlottesville, VA; Bruce (Cheryle) Alee in Plainfield, their children Matthew and Katie Allee. She is also survived by her brother Joe (Carol) Riley of Pendleton. Madonna graduated from Marshall High School in 1946. In high school she enjoyed playing girls basketball. As a young woman, she worked at Kraft Foods in Marshall. She went to work at Overpeck Gas in Marshall as a secretary. She then became manager and retired with that title. In 2001 she was one of only 5 women ever elected to the Indiana Propane Gas Association Board of Directors. For over 30 years she was a fixture on the square in Rockville during the Covered Bridge Festival. She made pumpkin butter on site selling to countless people over the years. In her retirement years she and Bo enjoyed being winter residents of Surprise, AZ. They won several awards and were recognized for their many acts of volunteerism in Surprise, AZ and Indiana. One of which they enjoyed while in Arizona was volunteering at the Sports Complex for the Sand Diego, Padres. For over 40 years she worked on numerous political campaigns and election boards. 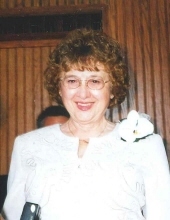 She served on the Joint Committee of Marshall Federated Church, active in the Busy Homemaker Home Ec Club, Garden Club, Main Street Rockville, Parke County Inc., and Extension Homemakers Executive Board. She was awarded “Cancer Control Volunteer of the Year” for the American Cancer Society. She was honored from Parke County “A Tribute to Women” for Indiana Federation of Republican Women. She also enjoyed sewing, reading and walking. Funeral services will be held Sunday, August 26, 2018, 3:00 p.m. at the Marshall Federated Church in Marshall. Friends may call from 1:00 to 3:00 p.m. on Sunday at the church. Burial will be in Bethany Cemetery, east of Marshall. Arrangements by Barnes and Rice Funeral Home of Rockville. Memorial contributions may be made to the American Heart Association / American Stroke Association, American Heart Association American Stroke Association, 3816 Paysphere Circle Chicago, IL 60674 or the Marshall Federated Church, PO Box 57, Marshall, IN 47859. To send flowers or a remembrance gift to the family of Madonna Dooley Allee, please visit our Tribute Store. "Email Address" would like to share the life celebration of Madonna Dooley Allee. Click on the "link" to go to share a favorite memory or leave a condolence message for the family.